One Sustainable Change: What does lye have to do with tomatoes? Some time ago (I may have even blogged about it), D. found a website that delved into the atrocities of canned tomatoes: something having to do with the BPA in the can being released into the fruit because of the acidity of the fruit and the processing agents. The culprit? Lye. Seems that most companies that sell canned tomatoes use lye to help in the peeling process (Cento, Redpack, and Furmano's to name a few). Other companies don't disclose their processing agents. And then there are the few who use steam only (Hunt's and Muir Glen, which are also rated highest for taste according to a test done by Cook's Illustrated magazine). What I love about this is that, just days before a friend brought me the article on product comparison, I had just bought a bottle of Muir Glen ketchup at Sunny Farms. I chose it over the Annie's Organic brand because it was distributed by Small Planet Foods, which is based in Sedro-Wooly, WA. Small Planet Foods (which makes Muir Glen and Cascadian Farm organic labels) is a General Mills company (which is headquartered in Missouri). I did a little research and could only find out that many of their tomatoes are from California, but that the company is based in Washington. Now for actual canned tomatoes? Well, since I am a Costco bargain shopper...I usually buy their S & W brand (which is not mentioned in the article from Cook's Illustrated). I tried to find specific info. 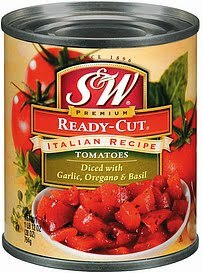 about the S & W brand and couldn't find much, but upon finding that they are a Del Monte company, I went to Del Monte's website and found out that, while they use lye to process their peaches and some other canned fruits, they use steam to process their tomatoes. I'm not sure if that means S & W does, too. Hmmm...anyone know?